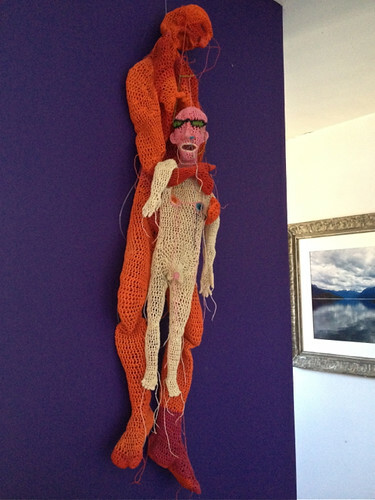 It's ages since I posted about my knitting. It's not that I've abandoned knitting. I still knit most days. But somehow, I've accomplished little. Sensibly,I realised that I would inevitably purchase yarns while I was travelling, so on my recent travels I took with me only one pre-planned project - Martina Behm's Viajante shawl. 'Shawl'. That's how I was thinking about and describing this project to myself and others. It seemed ideal for travelling. Not only does 'viajante' mean 'traveller' in Portuguese, but the pattern is composed of vast expanses of stocking stitch - ideal when I needed something that required little concentration. 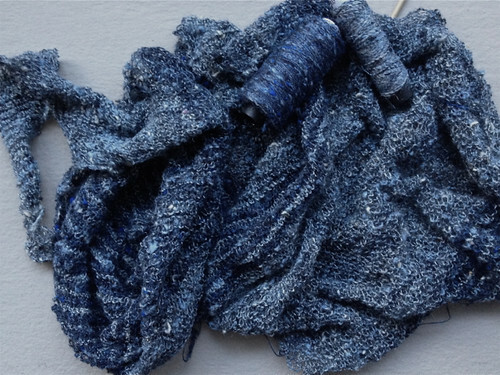 It's a perfect project for a huge skein of Wollmeise lace-weight yarn (a kilometre and a half of yarn!) 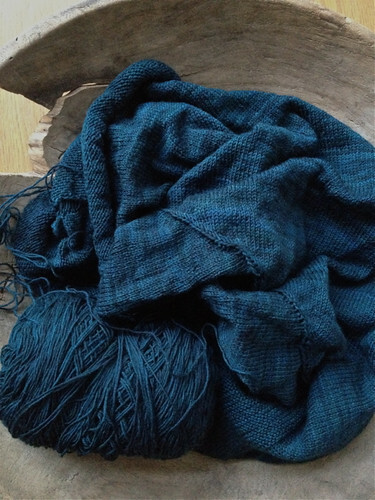 and I had a lovely deep green-blue in my yarn collection. So I knitted and knitted. 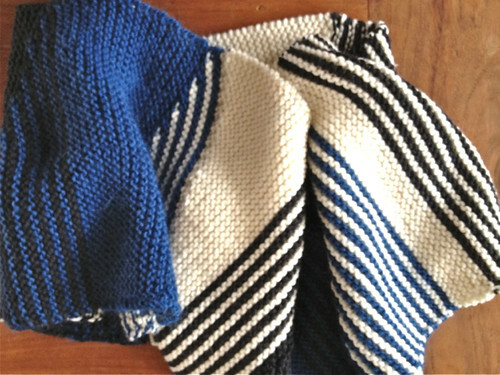 Inevitably I was a bit distracted by other projects, but I knitted and knitted. On my way home from the Netherlands to Australia I stopped in the Philippines to catch up with my son and grandson. My son is absolutely uninterested in and unknowledgeable about fashion and dress more generally, but he did ask what I was knitting. By now it was clear that the 'shawl' was rather unusual, as it is knitted in the round. 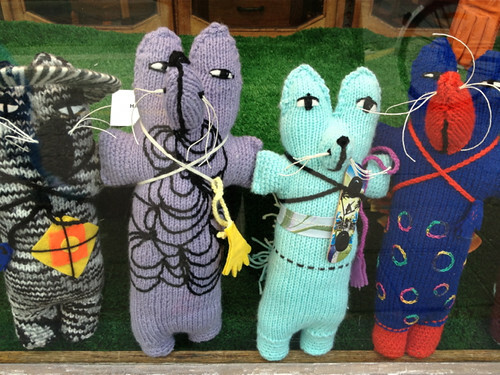 'Oh', he said, 'you're knitting a poncho'. He was right. I was knitting a poncho. It's an asymmetrical and beautifully designed poncho, but a poncho nonetheless. I wore ponchos in the seventies. In fact, I knitted and crocheted the ponchos I wore in the seventies, but if there is one style of garment I now regard with horror, it's a poncho. I kept knitting. I tried to ignore the fact that the project on which I had spent so much time was really a poncho. A couple of nights ago I made a minor error in my knitting and as I pulled the stitches off the needles to remedy the mistake I finally found the courage to abandon Viajante. I've not quite abandoned it. I haven't yet unravelled the knitting - mainly because I can't figure out how to deal with the kilometre or so of yarn I will have to re-skein or rewind if I do so. But I'm no longer knitting and knitting on it, and it's a relief. So what else did I knit? 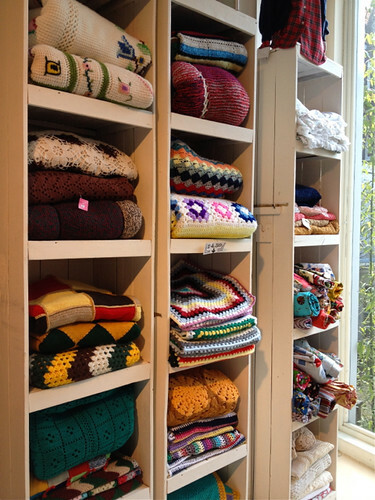 I blogged about my visit to the Breidag (knitting day) in the Netherlands and my discovery of the unusual and wonderful yarns at the Bart & Francis stall. I purchased some silk shantung yarn - that's really thread. It is so fine that I would never have realised it could be knitted except that the stall had an example of it knitted up rather loosely. I fell in love with the texture. 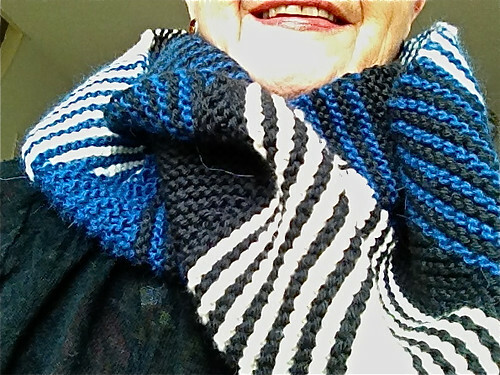 So, I'm knitting a simple Baktus scarf in grey with random darker blue stripes. Slow knitting as the thread is so fine and prone to tangle upon itself. But it's not a poncho and I know I will enjoy wearing it. And I actually finished a project while I was in Amsterdam. My friend Mieke rode her bike to visit me one cold day. As she offered her cheek for the very Dutch three greeting kisses, her skin was icy. I decided to knit a cowl for bike riding. Mieke dresses very stylishly, but most individually. Lots of black, lots of stripes, and shots of vibrant colours. 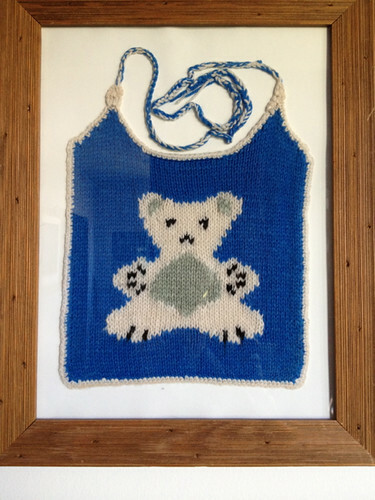 A perfect recipient for one of Veera Valimaki's graphic patterns. So I chose the Simple Sprinkle pattern and bought some black, white and deep bright blue Rowan aran weight yarns in alpaca and wool. I liked the outcome, and I think Mieke did too. In the last day or so I've begun a new project to distract me from my failed Viajante. But it's a bit of an experiment and I'm not sure it will work. It seems a bit like tempting fate to share it just yet. Clearly, it's by the same artist as the piece in my exchange apartment, though this time it's two female figures titled 'Twins'. 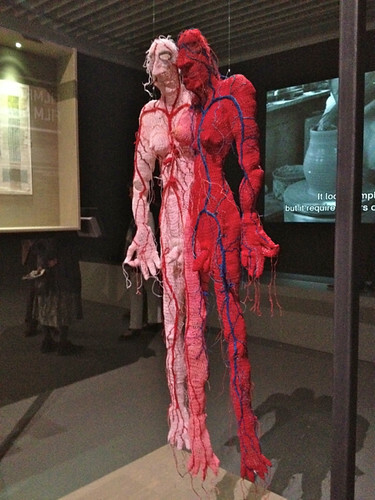 The artist's name is Johanna Schweizer. She's now 65 but has only recently gained a reputation for her wonderful work. The apartment had a number of teddy bear themed art pieces or objects, but this must have been the original one. I asked my house exchanger about it and apparently the bib was knitted by his mother when he was a baby. 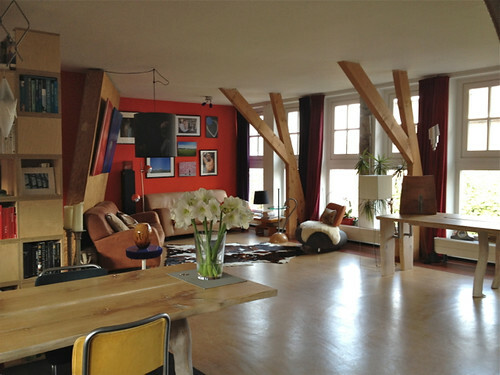 A great design in typical Dutch colours. 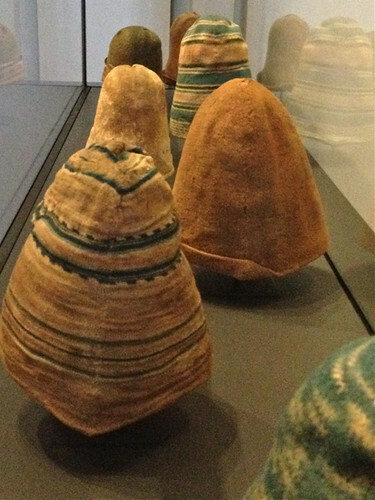 Exhibit in the Rijksmuseum - woollen caps worn by Dutch whalers, discovered in 1980 by archeologists investigating the burial places of 185 Dutch whalers who had died near Spitsbergen during the seventeenth century.The skeletons were still wearing their knitted woollen caps. Each cap was individualised and the museum information claims that the men recognised one another only by the pattern of stripes on their caps as they were bundled up so tightly against the fierce cold that only their eyes were visible. 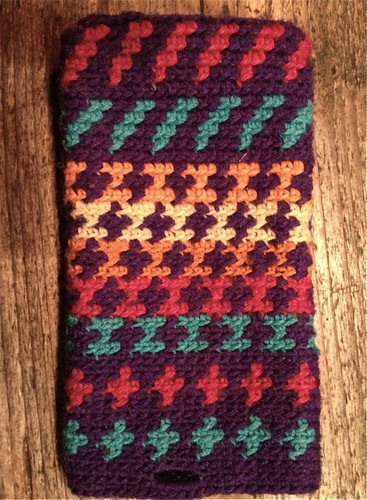 Phone cover made by Meian (ravelry name) of the De Pijp knitting group in Amsterdam. I've forgotten the name of the technique she used, so if you're reading this, Meian, can you please remind me? 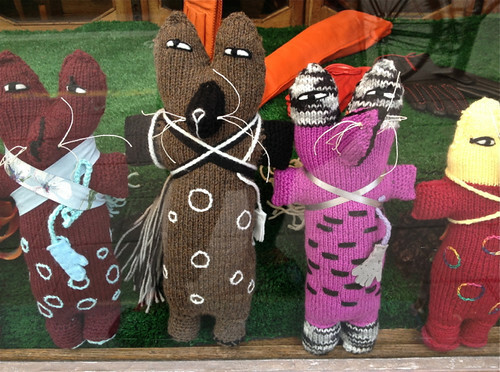 And finally, a frieze of knitted mice (at least, I think they're mice. Maybe they're not. Maybe they're something from popular culture of which I'm completely unaware) decorating a very upmarket shop in Antwerp. There must have been at least 30 of them, each one individualised. Lots of these pieces are quite inspirational. 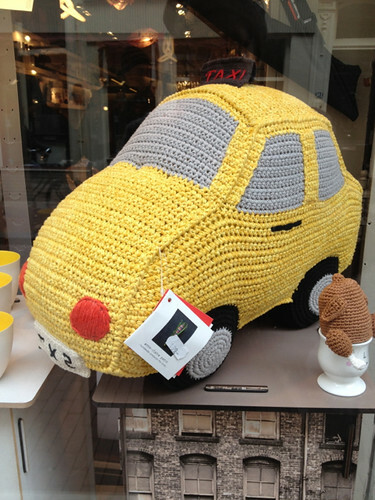 Clearly, knitting and crochet can be used in creative, individual, and appealing ways. I'm such a fan of house exchanging. 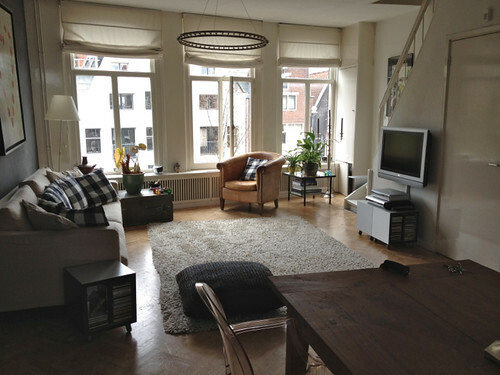 I've been able to stay in Amsterdam for six weeks with no accommodation expenses other than those for the couple of days I spent in Belgium. But beyond the obvious economic reasons for house exchanging it also enables you to have all the amenities of 'home' (such as laundry facilities) and gives you access to neighbourhoods with an immediacy that's not possible when you stay in a hotel - much as I love staying in hotels! 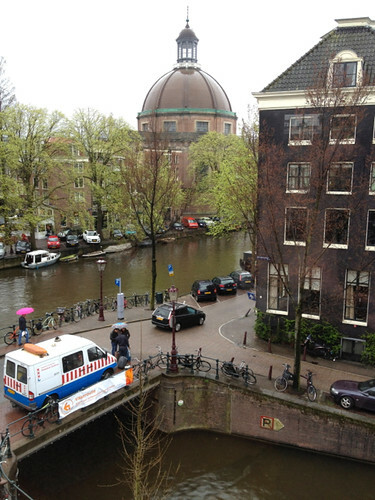 I've had two different houses - the first for most of my time in an area of Amsterdam called De Pijp, and the last week and a bit in an old canal house on the Brouwersgracht canal. I've enjoyed making comparisons between the neighbourhoods. De Pijp is south from the old centre of Amsterdam - just outside the central canal ring. 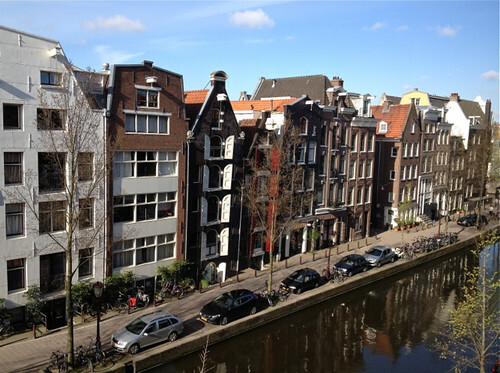 The area was developed during the 1920s when Amsterdam experienced significant expansion. 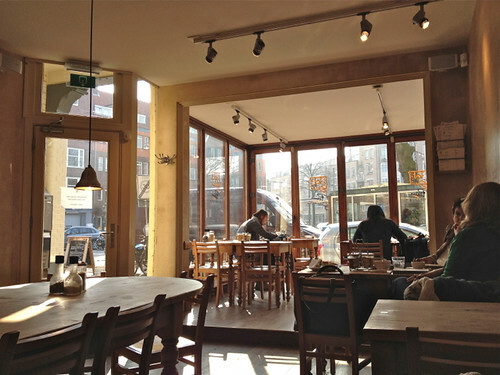 De Pijp is reputed to be one of the most multi-cultural areas of Amsterdam and, like many such areas, is rapidly gentrifying. My swap apartment was part of a block that was originally developed by the Catholic Church. There is a large church on one corner - still used as a church and with frequent, very tuneful church bells - but the remainder of the buildings on the block which had once housed a school and convent are now used for other purposes. My apartment had been developed from what had once been the convent, and around the corner there was a hotel, the police station, and some kind of community services building. 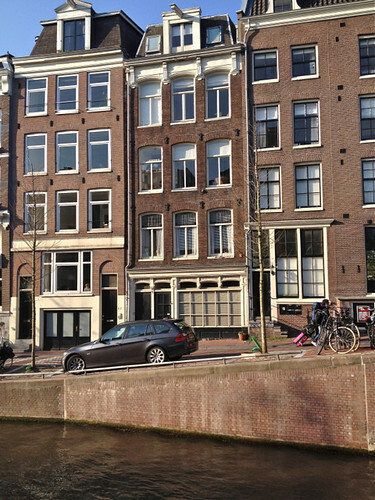 One of the things I like about Amsterdam is the way blocks of buildings house a variety of functions. where one can stroll along the canal side and watch the boats and ducks and people taking advantage of the brief winter sunshine. 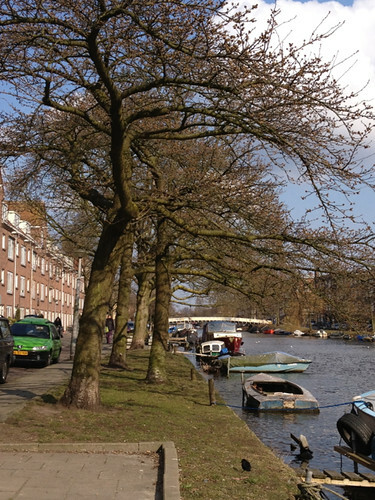 In a city that's so very densely populated and where people live in comparatively small spaces the canals open up the landscape and provide some sense of contact with nature. 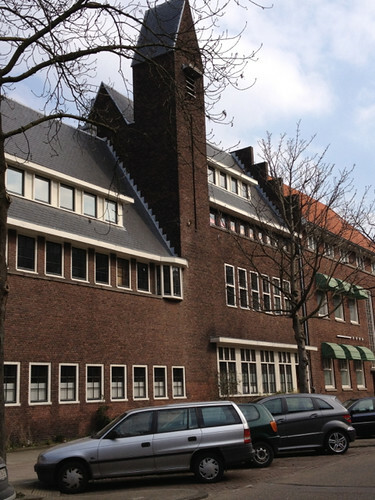 But the 1920s also produced what's become known as the Amsterdam School of Architecture. 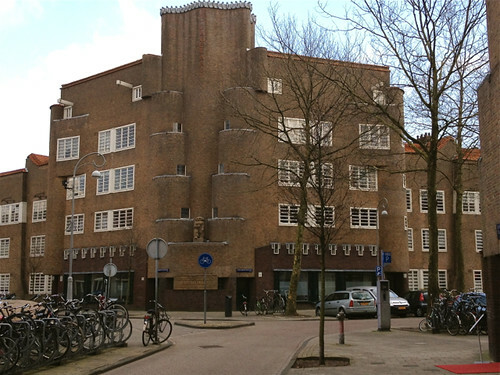 A few blocks from where I was staying in De Pijp is a complex of buildings called De Dageraad, designed by renowned architect Piet Kramer and built in the early 1920s. 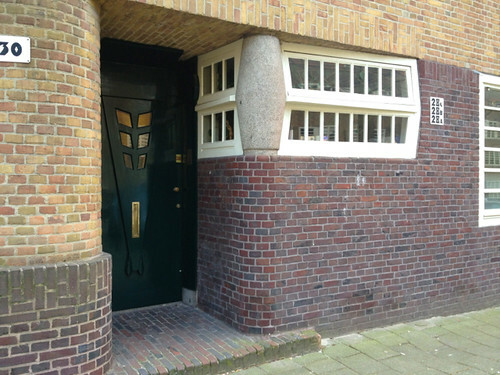 Like other Dutch architects of this time Kramer was inspired by the socialist ideal of making housing for the poor that was functional and aesthetically pleasing. He built in brick, but was concerned to provide flowing lines and detail that expressed character. Needless to say, few of the 'poor' could any longer afford to live in these buildings. 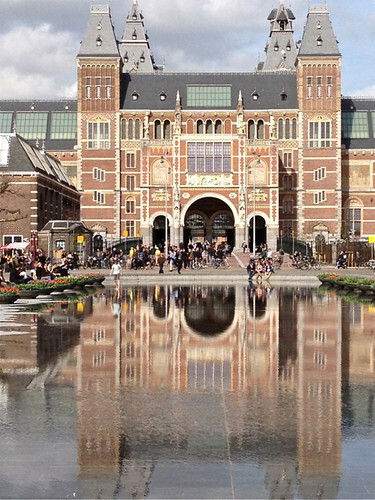 I've really fallen for the Amsterdam School of Architecture and have been planning in my mind an itinerary that would visit most of its major achievements! 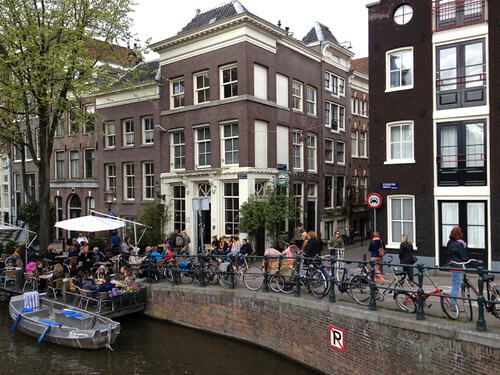 If I were going to live in Amsterdam I think I might prefer the relative calm of De Pijp, though I've also enjoyed the busy beauty of living on one of the most beautiful canals. I feel very fortunate to have had both of these experiences. I've now also met both my exchange partners and liked them very much. Maybe we'll have more exchange opportunities in the future. By the way, for those who are interested, I've used www.homeforexchange.com to organise my house exchanges and have found it most satisfactory. I'm almost at the end of my time in Amsterdam and I've been busy trying to cram in visits and events that a few weeks ago I seemed to have so much time to see. Then, because I've been busy, which inevitably means lots of walking, I've been tired in the evenings. 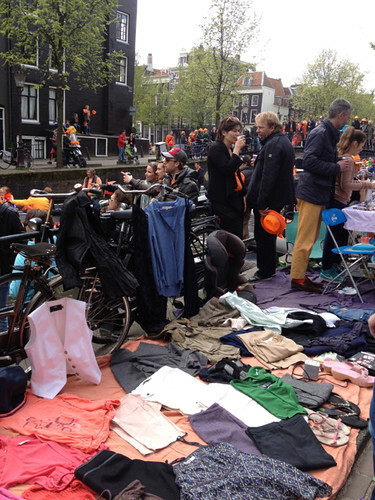 Blogging has suffered, so my post on Queensday is a bit late as the day itself was last Tuesday. But I did want to write something about it because it was such an Event (with a capital E). Queensday celebrates the Queen's birthday. Well, it celebrated the past Queen's birthday. Now that the Netherlands has a new King it will be Kingsday and from now on will be celebrated on his real birthday - 27 April. This year it was also the day that Queen Beatrix abdicated from the throne and that the installation of the new King Willem-Alexander was celebrated. Some thoughts on that later. 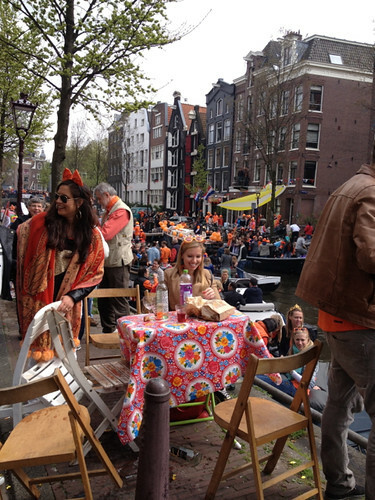 Queensday is rather amazing for an outsider. It's partly a massive garage sale, partly a street party to which everybody is invited, and generally an occasion for much good-natured, noisy, letting your hair down. Everybody dresses in orange (because the Dutch royal family comes from the House of Orange); t-shirts, hats, feather boas, or sometimes whole suits. Early in the morning people set up tables or lay out blankets in the street with whatever is to hand - clothing, toys, bric-a-brac, cupcakes, orange juice, apple pie and (occasionally) handmade craft items. Many of the stalls are managed by children and most items are sold for just a few euros. 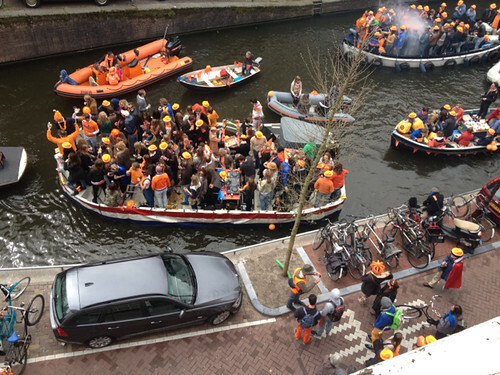 This last week or so I've been staying in a house on the Brouwersgracht canal and so I had an excellent view of the activities on the canal. Pottering along the canals in whatever kind of boat is available seems to be a popular Amsterdam activity, particularly at the weekend. 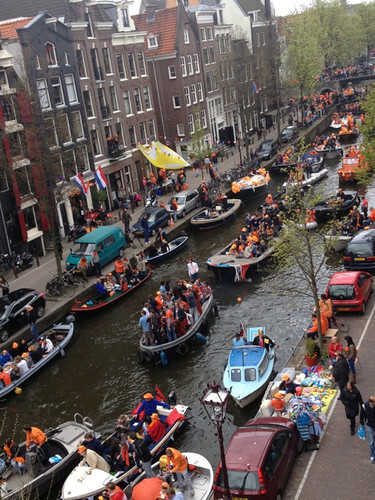 On Queensday, taking to the canals on a boat increases a hundred fold. Some of the boats seemed quite civilised, with family members, dogs, pots of coffee and the inevitable apple cake. But most were crammed full of people, dancing (yes, dancing), drinking, and with music blaring so loud that the panes in the old windows of my house constantly vibrated. I kept waiting for someone to fall overboard, or for 'canal rage' to develop as the boats waited to pass under the narrow bridge at the end of my street, but none of this happened. Despite the chaos and noise it all seemed very happy and good-natured. Afterwards, the mayor reported that there had been no misadventures on the day, other than the arrest of two republicans who were protesting against the King's installation, and even then the policeman who carried out the arrest was required to apologise to the people arrested and reportedly take them a bouquet of flowers. 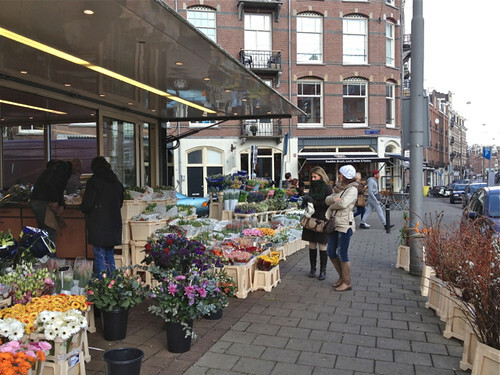 The Dutch take their flowers very seriously. In the lulls between jostling my way through the streets and anticipating disaster for the boats in the canals I watched the abdication and installation on television. As the commentary was in Dutch I could only watch and deduce and wonder about the goings-on. In comparison with British royal events, it all seemed low-key and much more affectionate and personal. To begin with, Queen Beatrix, like her mother before her, had chosen to abdicate to have a monarch whose world-view is more resonant with the current zeitgeist. The abdication was a simple ceremony in which Beatrix signed a document which was then witnessed by the king and queen to be and members of the parliamentary cabinet. There were misted eyes, fond glances between the queen and her son and daughter-in-law and hugs and kisses. Later, the ceremony in which the king was installed was very straightforward (even though he wore a rather magnificent ermine cloak and the new queen had a very sparkly diamond and sapphire tiara.) Essentially the new king gave a speech and then he and the members of parliament swore to uphold the laws of the land or some such. Everything is much simpler when it has no religious component. The old queen, now again a princess, sat with her three small, blond grand-daughters and again the informality and fondness of their relationship was evident. I was fascinated by the dress code - or lack thereof - for the event. Some of the male parliamentarians - particularly those of the left - turned up in open-neck shirts and informal jackets. Some of the women wore pants or simple dresses. Others had taken the opportunity to dress up with grand hats (the women) and morning suits (the men). The grander guests must have received clearer instructions. The princes and princesses from other countries, such as Charles and Camilla and 'our Mary' from Denmark, were quite formal, with the women in long gowns and hats - a rather odd combination not called for by many occasions. The numerous women of the Dutch royal family, aunts and first cousins, also wore hats and long gowns, but they also had trains to their dresses. I imagine there must have been lots of phone calls and emails to check what each other was wearing. I thought it was a successful combination of ceremony and informality. As one of my Dutch friends who is a republican said, the current royal family are so successful in building a relationship with their people that they make it hard to be a republican in the Netherlands. And of course, the flowers for the occasion were wonderful.